It's About Sales; It's About Visits; It's About The Numbers! T.R.A.F.F.I.C. 10th Anniversary Promo from T.R.A.F.F.I.C. on Vimeo. What if you had a bus filled with gamblers drive by your casino every day? The people on that bus can't exactly play slot machines while the bus rolls by. Even if you have 100 buses filled with 50 people each drive by to look at your casino, the eyeballs are useless to you. With 5,000 people rolling by, your casino remains empty. Your slots don't jingle, and your pockets don't jingle, either. So, the traffic that rolls by your casino, while considerable, provides nothing to you. Now imagine having a single bus come to your casino and drop off 50 people. Each one comes inside and drops $1000. You've just made $50,000 in one busload. Forget about the busses that pass you by; take the bus that stops in for a visit. This is what quality domains do. They bring traffic to the doorstep of the casino, the doorstep of the jewelry store, the doorstep of the restaurant or the shoe store or the anything! That's what makes a sale, and until a sale is made, nothing else will happen. Period! The quality of your traffic matters, and it always will. With quality traffic comes sales. If you are buying 1,000 visits and converting only one sale, then why are the other visitors leaving? Why did the other visitors bother to come to you? What is the quality of your traffic? Imagine having 1,000 visitors lined up at your jewelry store each day to buy a watch, a ring or a bracelet. That is exactly what TARGETED TRAFFIC is all about; that is what we mean by "Type-in Traffic", or direct navigation. T.R.A.F.F.I.C. 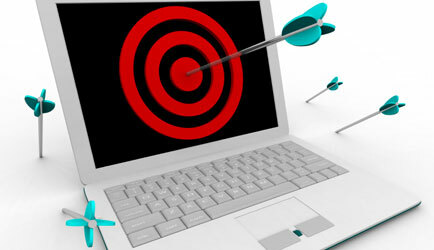 is about identifying your target audience and about determining the how your domain investment porfolio fits that goal. The ONLY major difference between those making money on the 'net and those that are not is the TRAFFIC THEY ARE BUYING. It comes down to whether have to pay for that traffic every month, like a magazine ad, or whether they had the foresight to buy the magazine and advertise free forever. • What is the cost of acquiring a new customer? • How many visitors must you get to close a sale? • If you can close 1 in 1000 what are you doing with the 999 visitors that don't make a purchase? • Why are they leaving? • Would you accept that figure in your real world store? • Why would you accept it online? • Why do think there is a difference? • Can your website function without human intervention? • Is "Stickiness" the reason for so many dot-com failures? • Have you been paying attention? It's very crowded out there. What are you doing to stand over your competition? To stand out? Your domain name is your #1 asset going forward. More important than your phone number is your website address. It has to be distinct and memorable. It must convey a message. It must do a lot. Location, Location, Location has never been this important. If you are paying $200k for a 30 second spot, shouldn't you make it easy for folks to remember and find you when they need you? Having a definitive and generic domain name is a powerful message and instant credibility. Would you buy the entire category heading in the yellow pages? You may like to, but you can't. With domains, you can OWN a market. Own a category. If you sell Candy shouldn't YOU be Candy.com? Sell books, why not be Books.com? Sell flowers, why not be Flowers.com? If you won't, your competition will and you will never recover. Define yourself, or be defined by your competition. As an End User, you must get in the game now or you will not have the same opportunity when you figure it out. The game has changed. Companies spend between $50,000 and $100,000 per month on Google advertising, and when they do so, they depend upon Google's own "quality engine" to determine their advertising rank, their sales position, whether they are relevant or not and so many other ranking factors. With the right domain name, you have the relevance! You have the right position! You don't need the Googles chasing irrelevant Yahoos to your domain, because you have the right name. What is amazing is that so many companies are still unwilling to see the value of a quality domain name! Why would you spend between $600,000 and $1.2-million per year on advertising when the right name can bring volumes more traffic, and without the alleged "quality filters" of the search engines? Odysseus probably didn't have the same difficulty as retailers have had with generic domain names. Generic domains have crushed brick and mortar businesses since the internet really got hold of the buying public! It is amazing that something as simple as hotels.com was not picked up by the big hotel chains, like Hilton or Westin or Marriott. Imagine how much more traffic General Motors would have if they bought cars.com, and by extension, newcars.com and usedcars.com? Kodak is going into bankruptcy! They didn't buy cameras.com, which sold at a T.R.A.F.F.I.C. auction for over $2,000,000! Imagine how that $2,000,000 could have saved America's iconic shutterbug company! T.R.A.F.F.I.C. started as a meeting of Rick's board in 2002. In 2004 it became the Targeted Redirects and Financial Fulfillment Internet Conference, or T.R.A.F.F.I.C., for short. Since that first show in Delray Beach, Florida, the show has continually redefined itself as the GOLD STANDARD of domain shows, because it is all about the best quality domains, best quality traffic, highest payouts, biggest business and the best opportunity. T.R.A.F.F.I.C. 's greatness that it brings key people together. It is exclusive, no doubt. The formula for T.R.A.F.F.I.C., the one that has produced the most successful shows in the domain industry, is not necessarily open to everyone, and it is not the cheapest show, which keeps the noise out of the program and the business in. This year at the beautiful and exclusive Ritz-Carlton Hotel on Fort Lauderdale Beach. However, if you act early, you will save nearly 50%. We create the atmosphere for serious business people to conduct business. T.R.A.F.F.I.C. is for real professionals, with the highest integrity and business ethics. We come together to do business and make deals. There is no time to waste. The Auctions have been historic. $12.5M in domains traded hands in just one 3 hour period at one of our shows. T.R.A.F.F.I.C. brings together the best of the best. It is a total TREAT for those serious about domains, traffic, developing and leveraging their assets as effectively as they can and bringing us all to the next level. The history of the domain industry and TRAFFIC are intertwined in a way that cannot be denied. End users will find a wealth of information and when they leave, they will never look at the Internet in the same manner. End users have been hosed time and time again starting with impression based advertising to where we are now with no way to pick the grade of your traffic. Sometimes the oil you think you are buying to run your website is just mud. Don't know what we are talking about? THAT is why end users need to be in attendance. Stop throwing away your ad dollars on traffic that does not make you money. Buy right from the drillers. Collectively, the core attendees control many millions of HIGH PROFILE domain names and even more millions of DAILY, unique visitors! That is TRAFFIC. Targeted TRAFFIC. The traffic that comes before you get to the search engines. Collectively, we buy thousands of domains every day of the week. We come from practically every corner of the globe, and we are from varied business backgrounds. We are an immensely powerful and forward-thinking business group that has finally been recognized for the power they wield and the knowledge they posses. Together with end users we can develop this traffic into clients and sales. Once the premium traffic is placed with a sponsor or a website is built, the likelihood of that traffic being available again diminishes with every passing day. And while you can always buy many different grades of search-engine traffic, pure type-in domain traffic is a passing commodity. That is even before we talk about the importance of a premiere domain name that passes all tests and is easy to spell and easy to remember. Which means it is easy to pass on.